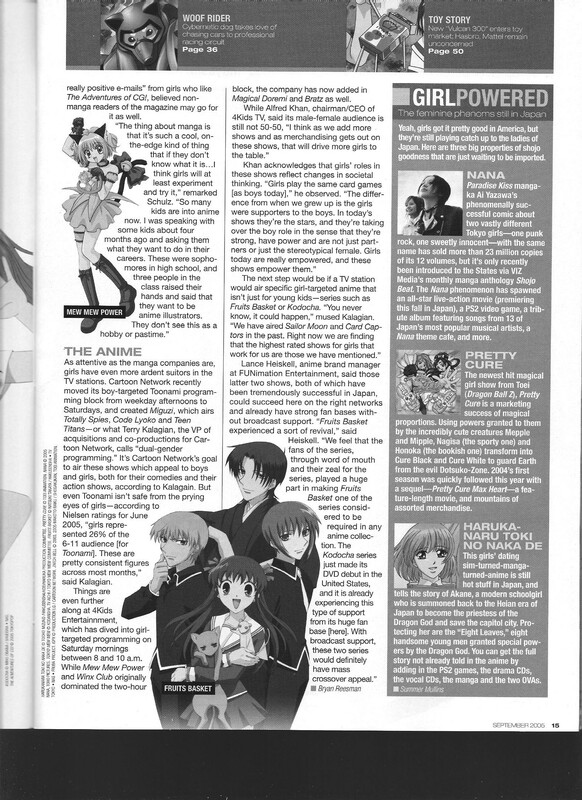 An interesting piece examining efforts by various people within the US anime/manga industry to reach female viewers, which also mentions that female viewers fairly consistently made up about 25% of the 6-11 viewership of toonami around this time (specifically, a 26% value for June 2005 is said to be “fairly consistent” by an industry source). Compared to other geeky pursuits anime seems to be pretty popular with girls. Of the various geeky niches in US, the anime fandom always seem to have the best gender balance. That’s obvious to see anytime we visit an anicon. Why it is so confounds me. Maybe it’s the cosplay culture, along with other forms of creative and social outlet that anime has to offer? But those subcultures exist in Japan too. Yet the fandom there were overwhelmingly otaku-centric until the recent fujoshi wave. Maybe the fandom simply matured earlier than other geeky niches? Gender balance has existed for so long that even places like ANN takes it for granted. I haven’t seen many good reasons over this pecularity yet, not even very many conjectures. If anyone does come across some interesting literature, please pass it forward!